Roy Stewart Moore is an American judge, Republican politician, and the current Chief Justice of the Alabama Supreme Court. In 2003, during Moore's first term as Chief Justice of the Alabama Supreme Court, he refused to remove a monument of the Ten Commandments from the Alabama Judicial Building despite orders to do so from a federal judge. On November 13, 2003, the Alabama Court of the Judiciary unanimously removed Moore from his post as Chief Justice. 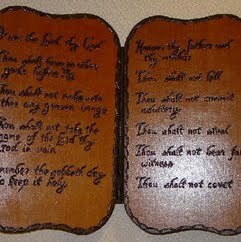 In the years preceding his first election to the state Supreme Court, Moore successfully resisted attempts to have a display of the Ten Commandments removed from the courtroom. The controversy around Moore generated national attention. Moore's supporters regard his stand as a defense of "judicial rights" and the Constitution of Alabama. Moore contended that federal judges who ruled against his actions consider "obedience of a court order superior to all other concerns, even the suppression of belief in the sovereignty of God." Moore sought the Republican nomination for the governorship of Alabama in 2006, but lost to incumbent Bob Riley in the June primary by a nearly 2-to-1 margin.